The anchor is up before sunrise in the Little Shark River. Our destination is Marathon Key, 38 miles to the south, where we will rendezvous once again with buddy boats Island Spirit, Catspaw and CAVU. Light winds out of the east dictate a motorsail to Marathon. Although the weather today is benign, we are racing against time to reach Marathon before the arrival of an intense cold front that is rapidly approaching from the northwest. By 8:30 AM, Cutter Loose is rounding Cape Sable to the east. Cape Sable is not one, but a series of protrusions into Gulf waters including Northwest Cape, Middle Cape and East Cape located about 8 miles west of the Everglades National Park Ranger Station and Visitors Center at Flamingo. 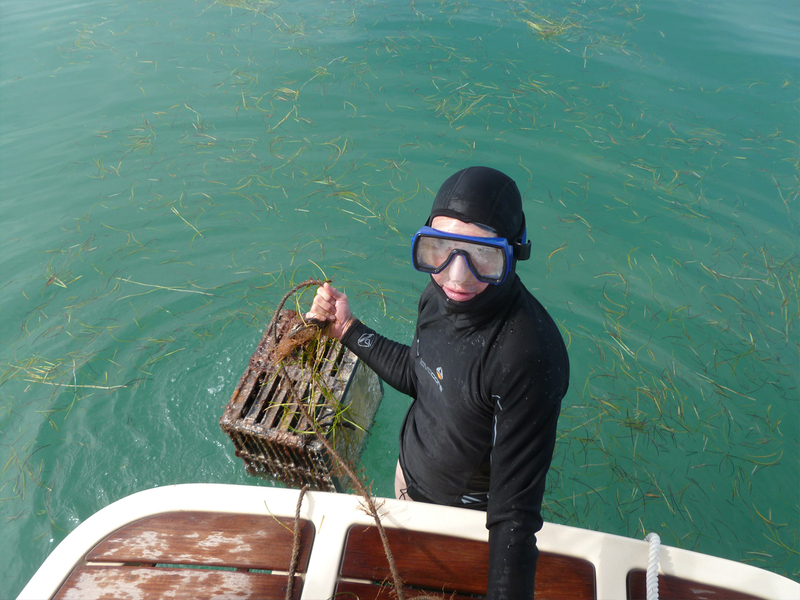 Our mid-morning progress towards Marathon is delayed as a result of snagging a crab pot. Pots are everywhere in these shallow waters. The styrofoam float on a line extending to the pot becomes wrapped in the rudder post. As a result, Cutter Loose is dragging the cage astern just below the surface of the water which adversely affects boat speed and poses the risk of wrapping the line around the propeller shaft. Since the weather is calm, a swim is in order to investigate, and, if possible, remove the tangled line. While diagnosing the problem is easy, removing the tangle is problematic. We settle for a partial fix…cutting the line with ample length and cleating the loose end of the line to the stern cleat in order to prevent it from wrapping around the prop. What began as a simple six hour journey becomes even more complicated in early afternoon as yet another pot is snagged. During our cruise to Maine, we managed to sail the entire summer without snagging a single pot. Snagging two pots in a single day adds insult to injury. Now behind schedule, we use the same technique as an interim fix in order to make progress towards Marathon. This time, the VHF comes alive with a transmission from a nearby sailboat, offering to be of assistance with scuba gear. We graciously accept the offer. 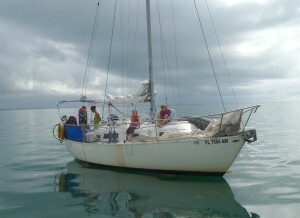 The 28 foot sailboat comes alongside Cutter Loose with its crew of two young parents and three very polite small children. They are liveaboards. Their vessel is of questionable seaworthiness. The Captain explains that he lost his job on the Gulf coast several years ago and that he and his family are living the dream. Within minutes, the underwater dive is complete and the crab pot episode is history. We offer thanks and make a financial contribution to their cruising kitty, watching in awe as they sail off to paradise. Was this chance encounter coincidence or providence? Finally at 3:30 PM, we are assisted into our slip at the Harbour Cay Club in Marathon by an army of volunteers. First in priority is a bath for Cutter Loose followed by careful positioning of fenders and double dock lines in anticipation of the forecasted blow. Afterwards, we enjoy a relaxing evening with friends at Porky’s, a funky BBQ joint featuring live entertainment and located within a short walk from HCC. The winds are light and the temperature and company are warm. It is a delightful evening to be outdoors, enjoying the calm before the storm.